This little soup is a true wonder weapon and part of the traditional Vietnamese cuisine such as pizza to Italy. The ingredients are simply powerful: Fresh coriander is good for the stomach, the Vitamin C of the lime helps with colds and the zinc in the beef makes for a strong immune system and reduces inflammation. This combination is unbeatable and helps against flu-like infections, abdominal pain and grief. Pho is a typical vietnamese street food and more of a breakfast. 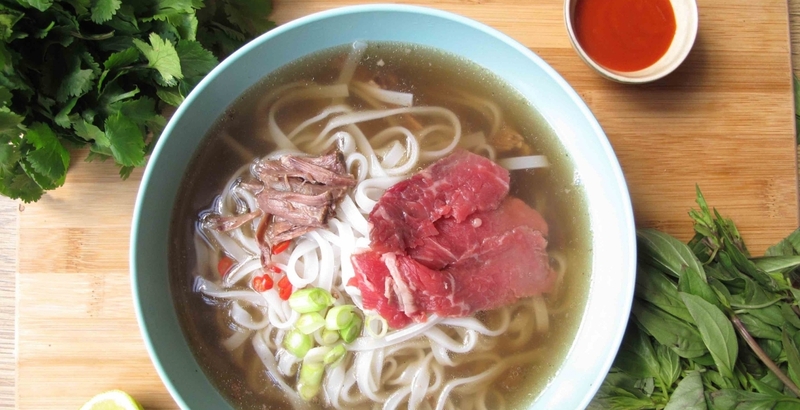 Below we will tell you how to make the perfect Pho with beef. Place the washed meat in a large pot (2-3 liters) and bring it to a boil. Peel the ginger and onion, fry it in a pan and then add it to the broth. Let the whole thing simmer for at least two hours at medium heat. Then add the star anise and cinnamon stick and let it boil for about an hour. In between season with salt and pepper. Take out the meat, the bone and the vegetables after about three to four hours. Loosen the soup meat and put it aside. Season the broth and possibly season again with salt, pepper and a few tablespoons of fish sauce. Cut the beef with a sharp knife into thin strips and put it aside. Cook the rice noodles according to package directions in salted water. Meanwhile wash mint, coriander and Thai basil. Pluck the leaves and chop them. Cut the spring onions and the chilli into small rings. Wash and cut the lime into quarter. Wash the sprouts. Almost done: Place the rice noodles, sprouts and cooked soup meat in a large bowl or deep dish, add the herbs and scallions. Subsequently, add the thin, raw beef slices and douse everything with the hot broth. The meat will very tender after few minutes. Finally refine with lime pieces and the chili rings.